Beautiful Battello Wedding Photos come from this prominent Jersey City venue. With its soaring ceilings, electrifying views of the Manhattan skyline, delicious cuisine and lovely spaces, the venue offers an unforgettable setting for Battello Wedding Photos. The biggest draw of a Battello wedding reception is the location’s access to a spectacular view of the New York City skyline, without the hassle of actually going into the city. Set along the shore of the Hudson River, Battello provides everything a couple could want in their special day. This photo captures the incredible joy of the day and the fun-loving relationship shared by the bride and groom. The groom wears a black tuxedo and black bow tie as he dips the bride on the dance floor during the couple’s first dance as newlyweds. The bride wears a gorgeous satin dress that sweeps across the floor while she dances with her husband. The bride’s dark brown hair is done simply in loose curls that spill down her back as she is spun, dipped, and held lovingly by the groom. The polished hardwood floors shine beneath their feet and this instant of joy is frozen by the flash of the camera. 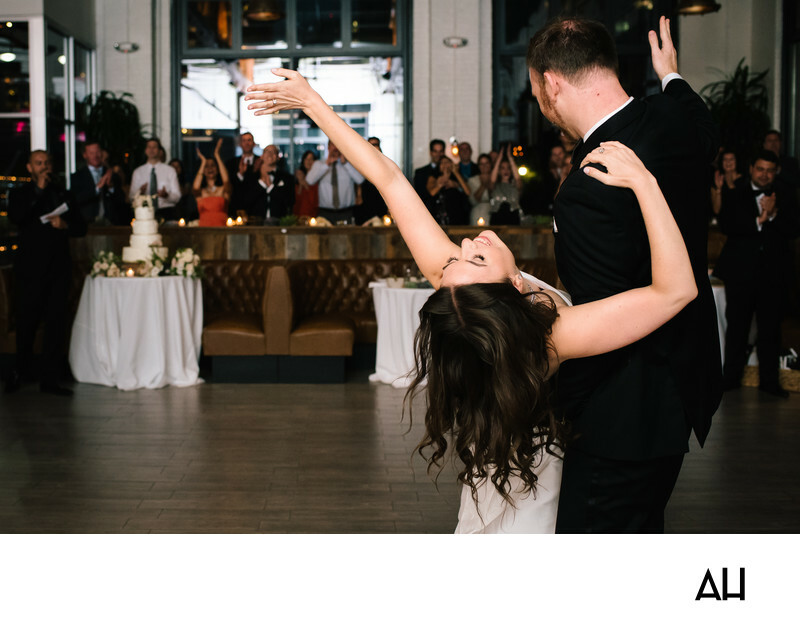 The couple revels in the carefree magic of the moment, with no one else on the dance floor with them. Guests stand behind a partition, and cheer the couple on, clapping along to the beat of the music. The pair throw their arms up in celebration, reveling in the happiness and love that has flowed through their wedding day.